Can he love her with both of his hearts? Can she accept the only life he is able to offer her? The moment Vali ran naked from the woods, Deltinica was captivated by his wild nature, but he was so much more than she ever expected. He was filled with honor, strength and courage and he was a man cursed for a crime that wasn’t his own. And she was a woman in love. She wasn't about to let his wolfish nature make him a stray forever. "Oh, the moon and her mercy." The grateful words flowed from Vali as he succumbed to the pleasure of the cool breeze across his bare body. He was once again able to walk on two legs and speak in the tongue of man. But, as the moon’s blessing always was, his time among men would be short. Only the three nights of the full moon would he have until he returned to the prison of his wolf form. The impending suffering dimmed his moment of pleasure. How many centuries had he watched pass in this never ending cycle? Too many, perhaps? Vali looked around to get his bearings. He hungered to see other people but it was more likely he would be far from settled areas and without a chance to meet a single soul. The wolf, who ruled his body, wanted only to run, hunt, and live wild as a wolf. It pushed out all thoughts of man and often took him far from what he, the man, wanted. This night, he was in a thick forest, near the crest of a hill. Opening his senses, he tried to tell if he might be near to any settlements or homesteads. He caught a slight equine scent as well that of smoke. He could hear the unsettled scurrying of the forest and picked up fear and anger with his empathy. To see more of the surrounding land, he climbed high into one of the larger trees. The night view was spectacular. Stretched out below him was a long valley, cradling a lake which glistened like black glass in the moonlight. The best part of the view was the small cabin that sat at the lake shore, with its thin smoke rising from it. The smoke thickened as he watched. A woman's scream and sounds of a fight could be heard. Vali dropped down with a wild grace and bolted toward the cabin. He reached the cleared lakeshore to find a lone woman attempting to hold off three woodland togters, huge, vicious, bear-like creatures. The woman rushed from one side of the porch to the other. She shot small darts at the togters, while the thatched roof burned above her. Vali approached behind the monsters, forming a plan to lead them away without battling directly with the fierce creatures. He moved silently away from the house to the small shelter and fence set for the animals. Using his wild scent he separated one of the five sturdy ponies and herded it from the fence stampeding the pony between two of the togters. Given their natural instincts to pursue running prey, they couldn’t help chasing after the fleet footed pony. Vali laughed at the success of the simple ploy while hurrying to the front of the house to see if he could help put the fire out. Even as he rounded the corner the woman threw a bucket of water onto the smoldering thatch. He stood transfixed watching the first human he'd seen in years. Even in her simple, brown dress, she had the beauty and grace of a goddess in every move. Her long, golden tresses were not quite tamed into a thick braid. She was tall and slim and moved with a confidence that spoke of a woman in control of her life. Turning to face him, she regarded him with a frankness that nearly made him blush. “I don’t know who you are or why you wear nothing but your own hide, but thank you for your aid.” Then she spun about and carried a second bucket of water back to the cabin door. He followed. What else could he do? Despite her curtness she was the company he coveted. Staying only a few steps behind, he watched as she knelt beside a large man and began to gently clean the terrible claw wounds across his chest. Vali stepped past her and silently went into the cabin to do her bidding. Such a smile should be forbidden for its control of the simple minded. He chuffed aloud at that, for his body was reacting to her nearness and oblivious to the slight chill of the air. But as he did remember some of the polite manners of men, he wrapped one piece of the woven cloth modestly about his waist. Then selecting several other pieces, he returned to her side. She finished cleaning the deep gouges and applied a thick salve to each before wrapping the cloth about the man’s chest covering the worst of the injuries. Vali tried to aid her by shifting the barely conscious man’s weight while listening to the soothing lilt of her soft voice. With her words, some strange tightness eased inside of Vali, an emotion he associated with his less civilized side. Possessiveness and jealousy had little purpose in his life as a man. Yet, that was what had cracked free when the injured man was identified as her father and not her lover. “Aye,” Vali answered and carefully lifted the man into his arms to move him. She stepped back and led him through the cabin to a small room in the back. He knew she had expected him to only shoulder her father, but the weight was not beyond bearing. He cradled the man easily and laid him onto the bed without jarring the wounds. She settled her father beneath a blanket before hurrying back out to recheck the roof thatch. When Vali again followed her, she turned her full disconcerting attention on him. “What brought you to my door and my aid?” She treated him to a full and approving appraisal while she waited his answer. “Forgive me. I was only passing through yon woods.” Passing through, that was the truth of his life. He passed through all the centuries having no chance to be part of any one age. “In truth, I own nothing and will never have more.” Such kindness shone from her eyes. Her accepting emotions washed over him. A deeper part of him felt soothed. He gave no response other than a raised brow in question. What could she offer him that had any chance of changing his dismal fate? “Father and I have been here only a year. There is much to do and now, I alone to do it. I offer meals and a place to rest for your toil.” She held her hand out to seal the barter. Vali wished for nothing more than to reach out and take her hand. Her generosity touched him to his soul, and he longed to hold onto the life she represented and so easily offered to share. Deltinica and her simple farmstead offered him everything. He couldn’t have chosen a better location with a bounty from both forest and fishing. And what they had, they’d improved into a safe haven, into a home. It was a dream come to life. But it was not to be. In three days the wolf would take control of him again and he might become a threat to her and her father. He must leave this place before his wild side had the chance to harm anyone here. “As you can.” She did not offer her hand again. “What work do you need the most?” He looked pointedly at the roof. Surely replacing the burnt thatch would be first. “Father and I just returned with the new mares. We will need to build a larger shelter and better pasture for them and the foals they carry.” She went back to her father leaving Vali to whatever he found to do. Vali walked around to get a feel of what needed done. And much was needed. For both the fencing and building he’d need wood. And the pasture needed fewer trees so that seemed the best place to start. He found an axe by the wood pile and set off to start felling trees by the full moon’s light. “My time is short and I wish to help while I can.” If she were kind enough to offer him the chance to spend time here, he was more than willing to pay for that time with his sweat. Deltinica turned away from him and headed back to the house, pretending to not see his pained look. Whatever kept Vali from accepting her bargain certainly hadn’t been the labor. She shouldn’t have been surprised. He had the build of a man used to using his body. His muscles rippled with each economic motion with the fluid grace of a forest predator. His actions, too, spoke of much time in the wilds. Of course his lack of propriety was completely to her benefit. The man had the body of a god and it was pure pleasure to see that body in all its naked glory. She reined in her wandering mind and continued back into the house. She had just shut the door when her father’s voice called out. “Daughter, what was that sound?” He sounded stronger than before. She hurried into the back room to reassure him. “It was only Vali, the man who came to our aid. He has begun cutting trees to supply the wood we will need to finish the fence and shelter for the ponies,” she explained while checking over his injuries. Thankfully, the claw marks showed no signs of festering. “Ambitious boy, then. That is good, though he must be a bit wild about the edges.” He caught her hand before she could leave. “A bit,” she answered. Those same thoughts had crossed her mind. Vali surely did seem the have some untamed nature to him. “I offered…” Her father interrupted her with more questions. “I don’t know much.” At her father’s incredulous look she added, “I believe he has seen hardship. Although he is barely civilized, he seems completely honorable.” It was there in Vali’s eyes when he met her gaze squarely even when standing naked before her. “You above any shouldn’t cast down at a bit of wildness,” she challenged. Of course her father would worry over who was in the area, but she couldn’t imagine that he would find any man a threat just because of a “bit of the wild”, as he put it. “Indeed, I am not, but you are a grown woman and should seek love wherever you might find it.” He shifted painfully. “Now leave me be. I need my rest, else I’ll be irritable.” He waved her toward the door. “It’s irritable you’ll be anyhow, but I’ll leave you here to rest.” Deltinica tucked his blankets in around him and left the room. She intended to head to her own bed, but instead found herself staring out the window into the darkness. In the distance, she heard the rhythmic thunk of the axe. Vali kept to a brisk pace, the sound of his strokes never faltering. What drove a man on to such hard labors? She yearned to return to the woods and be with him, to learn who he was and what restrained his choices. Whatever drove him was to her benefit. His kindness would save her and her father much delay. A sudden thought crossed her mind on how she could thank him, besides the stew that was kept warm in a pot over the fire. She gathered the materials about the table and settled in to start the project. The sound of his work was motivation to work long into the night. She caught herself humming a song in beat with the rhythm of his axe falls. 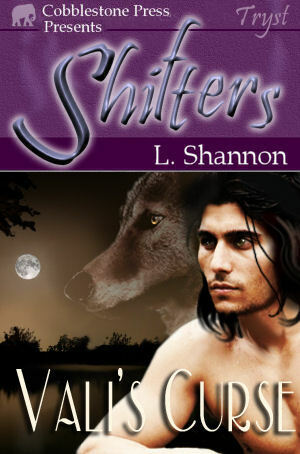 Look for Vali's Curse November 10, 2006 with Cobblestone Press!